In the tradition of Google, ICTWorks (a platform to encourage collaboration between ICT practitioners in the developing world) needed a good story for April Fool's Day. I haven't been writing as much as I'd have liked lately, but I'm pretty happy with this short piece on Goat Powered Mesh Networking I put together with Wayan Vota, Inveneo's Senior ICIP Director. The WiFi hackers at Inveneo, famous for their long-distance network in Haiti, are piloting a new Internet connectivity solution that they hope will bring Internet access to currently unreachable corners of rural Africa. 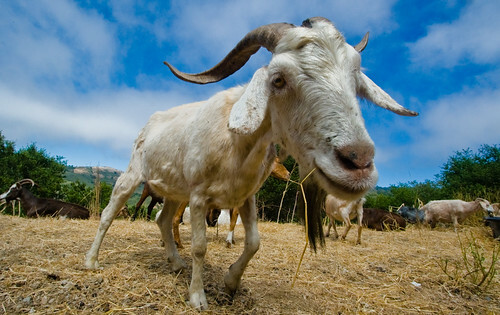 Deploying collar-mounted wireless transceivers on a herd's worth of goats, they've created a mobile, self-healing, self-configuring network they've dubbed the Goat*Net. To learn more about Goat*Net, read the full story here. Note this is not my photo, it's courtesy of Eliya, thanks to a CreativeCommons license on flickr.